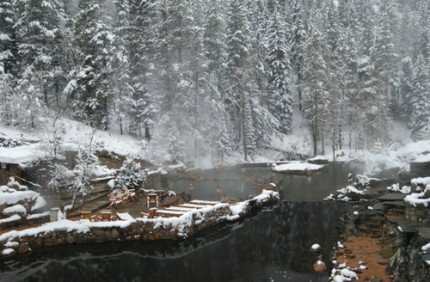 Warm, relaxing and rejuvenating… Have you been to a hot spring lately? It's been an amazing weekend here in Colorado, Kevin and I spent yesterday evening at Strawberry Hot Springs in Steamboat. Soaking in mineral waters can hydrate your skin, open your pores, soften your completion, tighten, but most of all relax your soul. When we were in Desert Hot Springs, CA a few years ago, we stayed at a place where hundreds of people now live because the warm healing waters helped soothe the pain of their arthritis. Our favorite hot spring is Breitenbush Hot Springs which are outside of Salem, Oregon, but Strawberry now is a close second or third. I also like Deep Creek Hot Springs outside of Hesperia, CA. The reason I'm telling you this is because I'd love for you to look and see if there are any springs near you to soak in. If there are, go ahead and take a day trip and if not, take a long weekend away to bathe away your wrinkles and worry. If they give you a feeling that's anything close to what I get when I'm there, you're in for a real treat! Anyway, I'm also writing today to share that there is two days left for our Give Back Black Friday sale. Click Here to Save 15% this Black Friday Weekend (Two Days Left)! I hope you're having an amazing holiday weekend (for those of you in the U.S.) and keep yourself beautiful by taking a well deserved rest.